Vice President Yemi Osinbajo has shrugged off calls to restructure Nigeria saying it is not helpful and will not make any difference. The vice president made the remark weekend while delivering the second foundation lecture of the Elizade University, Ilara-Mokin, Ondo State, according to a statement by his Senior Special Assistant Media and Publicity, Laolu Akande. The title of the lecture was “The Future is Here Earlier Than We Thought.” The call for restructuring Nigeria has been a recurring decimal and of late reignited by former Vice President, Atiku Abubakar. In a speech at launch of a book: ‘We Are Biafrans,’ in Abuja in June, Atiku said what Nigeria required most was restructuring of the federation. His remarks were immediately praised by the pan-Yoruba socio-cultural group, Afenifere, and the apexsocio-political association of the Igbo, the Ohanaeze Ndigbo who argued that the move would provide solutions to the country’s problems. 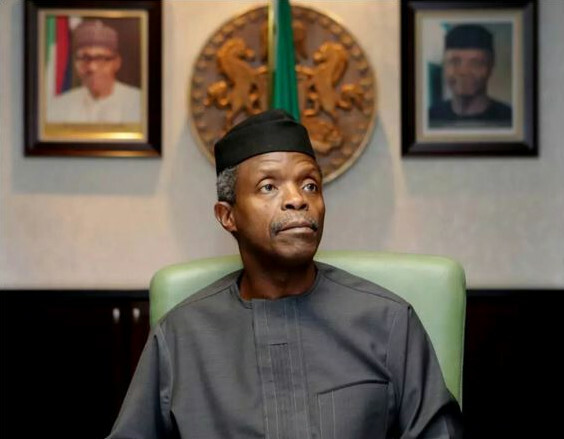 However, the vice president, while answering a question on restructuring, stated: “Even if states are given half of the resources of the federal government, the situation will not change. The vice president also stated that the country was not earning enough from oil and taxes anymore. He noted the nation was blessed and that every state could feed itself and export products if the citizens engaged in agriculture. He disclosed that this year, the Federal Government would establish technology hubs across Nigeria. “Two super hubs in Abuja and Lagos and six regional hubs in the six geo-political zones. In partnership with several technology companies the hubs will be fully resourced with infrastructure and capacity building,” he said. He added that in few weeks’ time, the government would begin to train a pool of 100,000 software developers, hardware service professionals, animators, graphic artists, building services professionals, artisans and others. He said in its quest to make Nigeria the technology hub of Africa, the government had launched a special presidential initiative on technology and start-ups. Osinbajo said understanding the way technology works and thinking out of the box is the way to go in today’s world. “Whatever you choose to do, be technology savvy and understand its best uses in your chosen discipline. You must learn to be a versatile operator, not a mono-skilled graduate. Everyone has a right to be rich, age is not a barrier,” he said. He said it was in recognition of the role of innovation and technology in the nation’s economic growth plan that the federal government provided extensively for technology and innovation in the 2016 budget. Daily Trust reports that former Vice President, Atiku Abubakar, had at a book launch in Abuja called for restructuring of the country in line with the aspirations of its component units, describing it as the only answer to the current agitation for a Biafra Republic, among others. “The call for restructuring is even more relevant today in the light of the governance and economic challenges facing us. And the rising tide of agitations, some militant and violent, require a re-set in our relationships as a united nation,” he said. The calls for the restructuring of the country had also attracted varied comments from Nigerians, including Nobel laureate, Prof. Wole Soyinka, who backs the calls and Prof Tam David-West, who is against it.